Mark Rothko (1903-1970) Untitled 1959 Öl auf Leinwand 269 × 457,8 cm © 1998 Kate Rothko Prizel & Christopher Rothko/Bildrecht, Wien, 2019 © Foto: National Gallery of Art, Washington, D.C.
Fortunately, the Kunsthistorisches Museum (KHM) decided to change that, bringing a comprehensive retrospective of the American artist’s work to Vienna – the first ever in the country. Curated by Jasper Sharp, the show broadly follows the artist’s life and career, providing an extensive overview of his work; Kate and Christopher Rothko, the artist’s children, were heavily involved in the development of this project. 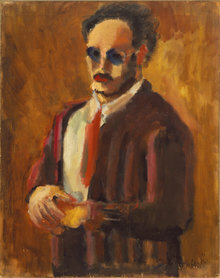 Born as Markus Rothkowitz in Latvia and immigrating to the United States as a child in 1913, Rothko’s Russian Jewish upbringing was a prominent theme in his early work: the loss of his father at the age of 10 had a profound effect on his worldview, preparing him for the hardships that life had in store. You can see his vulnerability in the tantalizing 1936 self-portrait of the artist that opens the exhibit, an attempt by the young Rothko to mimic Rembrandt’s iconic 1659 self-portrait. A major influence, Rothko spent hours in the Metropolitan Museum of Art immersing himself in Rembrandt’s paintings; the somber body language and darkened color palette matches his hero’s, with both conspicuously lacking facial expressions. An adventurous spirit and determination to overcome adversity allowed him to grow, as he eventually found himself in a place where he planned to ‘wander around, bum about, and starve a bit.’ New York City became a major early influence, with Rothko frequently drawing inspiration from his home town with scenes of commuters on the subway and other slices of life painted in a mix of surrealism and expressionism. His Underground Fantasy depicts passengers waiting for the subway; somber, stylized, tall and slender, the silence is palpable, making for a melancholy slice everyday life. Losing yourself in Rothko’s early period is not a difficult task; influenced by numerous trips to Europe with his family, his paintings from that time a cavalcade of various styles, all eminently accessible. It was only later that Rothko found his characteristic, abstract expressionist style. A former subdirector of the Guggenheim Museum in Bilbao, Miguel Lopez Remiro, described Rothko as an artist that “preferred to tell little” and renounced “self-expression” in his later works, pinpointing the artist’s intentions towards the end of his career. 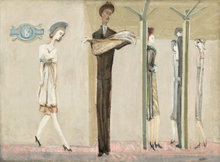 The transition between his earlier works to his better known “multiforms” is accurately depicted in a hallway connecting the two contrasting periods, showcasing a series of untitled works where the artist experimented with meshing thin layers of colors with soft-edged rectangular shapes to create a newfound form of abstract expressionism. But for Rothko, it was less about color than immersion; he aimed to create a dynamic, emotional relationship between painting and viewer. “And if you, as you say, are moved only by the color relationships, then you miss the point,” said Rothko in an interview with writer Selden Rodman. Indeed, you feel miniscule compared to the immensity of the murals placed before you; perhaps not quite a spiritual experience, but undeniably profound. The effect is supported by the lighting, which undergoes gradual changes as you proceed, giving you the feeling of slowly being absorbed within the walls of the artist’s presence. Passing through the evolution of Rothko’s work takes the viewer on a journey that instills a sense of bewilderment; where other artists have a signature style, Rothko defies categorization, having carved out a niche of his own. After this artistic odyssey, you may find yourself asking questions that only Rothko himself knew the answer to. 20 years of age and currently working as a journalist, Jakob Weizman is Danish-Colombian and grew up in Washington D.C. He also lived in Bogota, New York, Denmark and currently resides in Pristina, Kosovo, where he's studying to achieve a double major in International Relations and Journalism. Currently in Vienna for an exchange semester at Webster University, he writes for Metropole while falling head over heels for one of the most fascinating cities in the world!